Health issues regarding the use of synthetic ingredients, such as sweeteners, have been gaining ground, prompting food and beverage manufacturers to seek out viable alternatives. Consumption of calorie-rich artificial sweeteners has been directly linked to an increase in low-density lipoprotein or “bad” cholesterol. Starch derivatives are derived by treating starch physically, chemically or enzymatically to obtain compounds with properties different from native starches. These products find wide application in several industries for a range of functions. In the food and beverage industry, starch derivatives are used as thickeners and stabilizers, while their pharmaceutical applications include tablet binders and drug release agents. Starch derivatives also find application in the cosmetics industry as emulsifiers and as fiber additives in the animal feed sector. Some starch derivatives, such as glucose syrup and maltodextrin that are low in calorie content are being extensively utilized by this industry as alternative sweeteners, without compromising on product quality. Cyclodextrins are another category of starch derivatives that are used in the pharmaceutical industry for enhancing solubility, bioavailability stability and flavors and reducing evaporation, odors, tastes and haemolysis. This compound can also be used for converting liquids and oils into free-flowing powders and preventing incompatibility among admixtures. Cyclodextrins are also useful for improving pharmaceutical formulations and drug delivery with peptide, protein and oligonucleotide dosage forms. Modified starches constitute another type of starch derivatives that are being widely adopted in industrial applications due to their superior biocompatible properties compared to synthetic polymers. These starches are also being increasingly used as alternatives to synthetic polymers for making sustained and controlled drug delivery systems. This global market report analyzes the starch derivatives product segments comprising Cyclodextrins Glucose Syrup, Hydrolysates, Maltodextrin and Modified Starches. The study also analyzes the key application areas of starch derivatives including Food & Feed Applications and Industrial Applications. These application areas further explored for sub-types of Food & Feed applications – Animal Feed, Confectioneries & Beverages and Processed Foods; and Industrial applications – Cosmetics & Personal Care Products, Papermaking, Pharmaceuticals and Other Industrial Applications. The study reviews, analyses and projects the starch derivatives for the global and regional markets including North America, Europe, Asia-Pacific, Latin America and Rest of World. The global market for Starch Derivatives is projected to reach US$75.4 billion by 2022 from a forecast US$53 billion in 2016 at a CAGR of 6.1% between 2016 and 2022. Cornering a share forecast to be 54.4% equating to US$28.8 billion in 2016, Glucose Syrup dominates the global market for Starch Derivatives, which is projected to reach US$41.1 billion by 2022 at a CAGR of 6.1% between the two years. 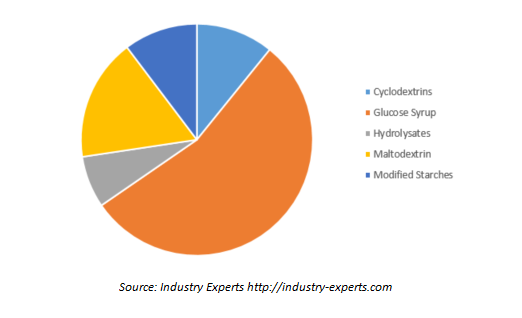 Over the same period, global demand for Maltodextrin is anticipated to record the fastest CAGR of 6.5% and reach a projected US$12.9 billion by 2022 from a forecast US$8.8 billion in 2016. The global market for Starch Derivatives is segmented into aforementioned five major regions. The regional markets further analyzed for 14 independent countries across North America – The United States and Canada; Europe – France, Germany, Italy, and the United Kingdom; Asia-Pacific – Australia, China, India, Japan and South Korea; Latin America – Argentina, Brazil and Mexico. The market for starch derivatives is analyzed in terms of value in USD for each region by key country, product segment and key application areas and sub-types of applications. This 324 page global market research report includes 248 charts (includes a data table and graphical representation for each chart), supported with meaningful and easy to understand graphical presentation, of market numbers. This report profiles 18 global market players across the globe. The research also provides the listing of the companies engaged in manufacturing and supply of starch derivatives. The global list of companies covers the address, contact numbers and the website addresses of 142 companies.